You know it’s a good night when a beautiful alignment of planets is the second best thing that’s going to happen. Thursday, August 12th, is such a night. 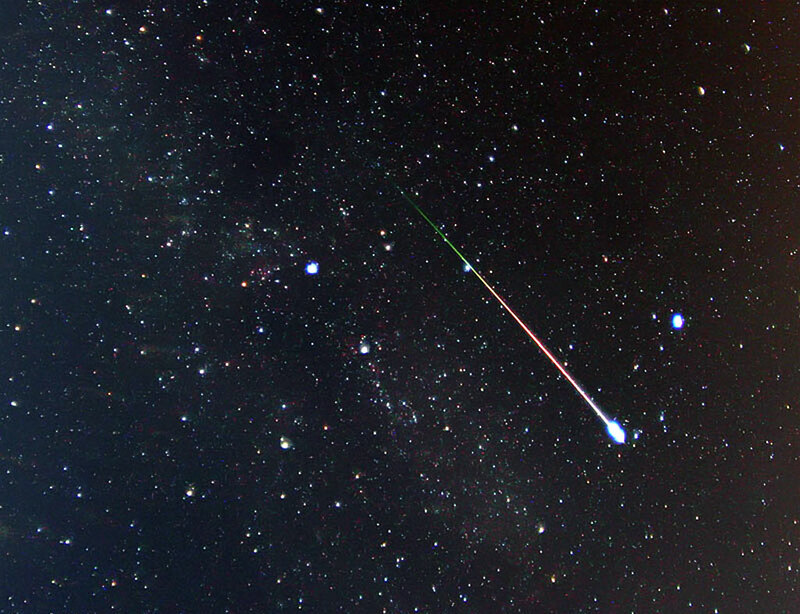 A Perseid meteor photographed in Aug. 2009 by Pete Lawrence of Selsey, UK. The show begins at sundown when Venus, Saturn, Mars and the crescent Moon pop out of the western twilight in tight conjunction. All four heavenly objects will fit within a circle about 10 degrees in diameter, beaming together through the dusky colors of sunset. No telescope is required to enjoy this naked-eye event. Swift-Tuttle’s debris zone is so wide, Earth spends weeks inside it. Indeed, we are in the outskirts now, and sky watchers are already reporting a trickle of late-night Perseids. The trickle could turn into a torrent between August 11th and 13th when Earth passes through the heart of the debris trail. Looking northeast around midnight on August 12th-13th. 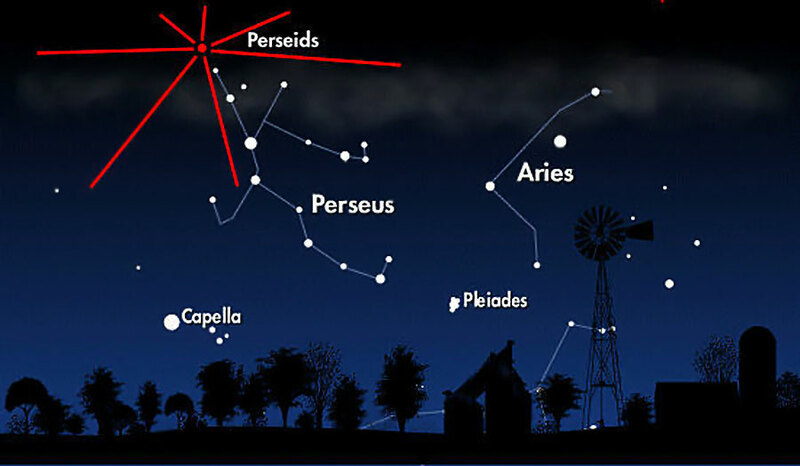 The red dot is the Perseid radiant. Although Perseid meteors can appear in any part of the sky, all of their tails will point back to the radiant. 2010 is a good year for Perseids because the Moon won’t be up during the midnight-to-dawn hours of greatest activity. Lunar glare can wipe out a good meteor shower, but that won’t be the case this time. As Perseus rises and the night deepens, meteor rates will increase. For sheer numbers, the best time to look is during the darkest hours before dawn on Friday morning, Aug. 13th, when most observers will see dozens of Perseids per hour.